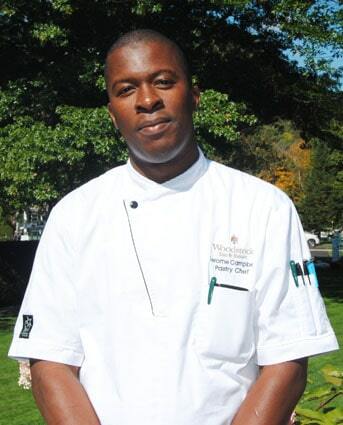 WOODSTOCK — On Wednesday, Oct. 8, Gary S. Thulander, president and general manager of the Woodstock Inn & Resort, announced the appointment of Lerome Campbell as new pastry chef at the resort’s dining venues, in particular, the Red Rooster restaurant. Campbell’s new seasonal dessert menu features choices such as cranberry spice mousse cake, a five-spice cake layered with cranberry jam and cinnamon mousse with whipped mascarpone cream; maple custard with bourbon roasted apples, a caramel crunch base and milk chocolate glaze; a rich chocolate cake layered with fudge frosting, vanilla bean chantilly cream and seasonal berry sauce, and others, including fresh takes on vanilla crème brulèe and classic carrot cheese cake. Campbell has spent a decade working in some of the hospitality industry’s leading resorts. Most recently, he was executive pastry chef at The Gasparilla Inn & Club in Boca Grande, Fla., and prior to that served as a pastry cook at the Ritz-Carlton in Naples, Fla., and The Sagamore Resort in Bolton Landing, N.Y. He also spent considerable time as a pastry cook at leading resorts on his home island of Jamaica. He received an associate’s degree in Science, Baking and Pastry from the Petersfield Vocational Training Centre in Jamaica and transitioned directly into his first position as a pastry cook at Hedonism II in Negril. Following that, he was the pastry cook at Sandals Resort, Negril, and then Sandals Resort, Whitehouse, Jamaica. The Woodstock Inn & Resort is owned and operated by The Woodstock Foundation, Inc. Proceeds from Resort operations support The Woodstock Foundation and Billings Farm & Museum education and conservation programs.